Vietnam, a country that I most saw and heard from Hollywood movies: blood, guns and war. So I decided to have a visit and experience it from my own point of view. I only brought my pocket camera this time. It was a rainy season in July. 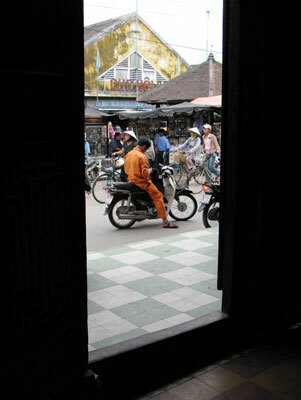 The trip started from the south: Ho Chi Minh, then flying to Hoi An and ended in Hanoi. I realized then that people were more friendly in southern part of Vietnam compared to the northern part, due to its business activities. I stayed at Majectic Hotel at the heart of Ho Chi Minh. Built in 1925, it was the oldest hotel in the city. Its collonial style gave a warm, comforting atmosphere, despite its location in the busy business district. We could see the Saigon river while having breakfast on the roof top restaurant. Quite lovely. I am always a big, big fan of food. So it meant a big deal during the trip. You should try pho bo tai and Vietnamese pancake at Ngon restaurant. The local beer was also quite nice, not mentioning the famous Vietnamese iced coffee, which is always very, very sweet. The other nice restaurant was Vietnam House on Dhong Khoi Street, also in collonial style. 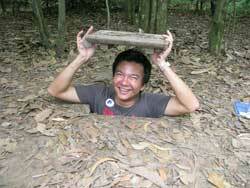 A must-see was Cuchi Tunnels, 60 km from Ho Chi Minh. You must have heard about it: hundreds of kilometres of secret tunnels that were used to fight the Americans. We then flew to Danang, and drove to Hoi An, in the middle part of Vietnam. I stayed at Hoi An Beach Resort (big room!) and enjoyed my complimentary dinner by the river, seeing hundreds of red candles floating, then picked up downstream by some boatmen, and let go floating again. Quite a funny job. As I love the sea, I went snorkeling and enjoyed the beach in Cham Island, organized by the local tour, after seeing some temples and paddy fields. The old China town, only 20 minutes away from the beach area was so vibrant and interesting. Rustique houses, restaurants and even garment shops. I also enjoyed the street market very much. On the 4th day, I flew to Hanoi, the capital of Vietnam, located up in the north. The first experience was not that nice as the taxy driver from the airport tried to cheat me. Sweet. It was more cultural than Ho Chi Minh, equally as busy, and definitely as frustrating to walk-through as everyone horned their cars and motorbikes like crazy. They probably enjoyed it as a stress-release mechanism. Service quality was also at the bottom of the sea. When I changed my money at a bank, the teller did not even bother to give a glance while throwing (yup, throwing) the cash to me. Sweet, again. I was glad that the hotel that I stayed, Church Hotel, offered the real hospitality. Located on Nha Tho (Church) street of the famous old quarter, between Hoan Kiem Lake and the Cathedral, the hotel is a fine retreat which is also in close proximity to the tourist attractions. Talking about hotel, I also had a drink at Sofitel Metropole. Built in 1901, the 5 star historic luxury hotel looked very nice in its French colonial style. It is located at 15 Ngo Quyen Street. 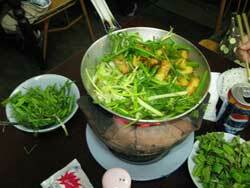 There was a street in Hanoi called Cha Ca street, where all the restaurants specialize in this dish. The most famous was Cha Ca La Vong, a tiny restaurant that had been owned by the same family for generations and which claimed to have first popularized the street. My visit to The Temple of Literature was also quite nice. It was founded in 1070 as a Confucian temple. The big courtyards were packed by local people, and tourists in the afternoon. 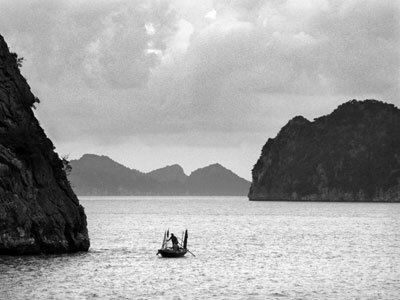 The highlight of the whole trip was the Halong Bay. Such a fascinating place. 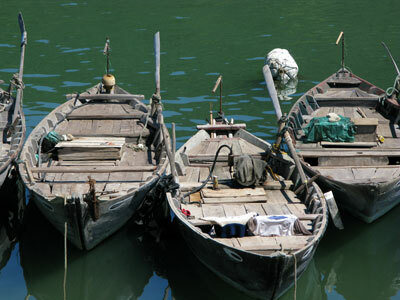 I spent a night at Valentine Junk Boat, which was worth US$350 per person based on twin occupancy. 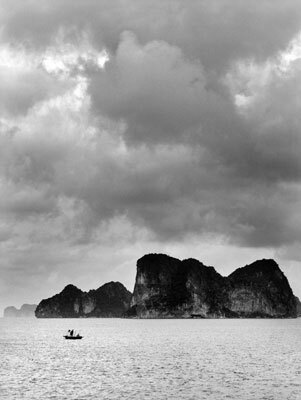 Besides enjoying the view and the exclusive fine dining, you can go kayaking, visiting vastinating caves and beaches. 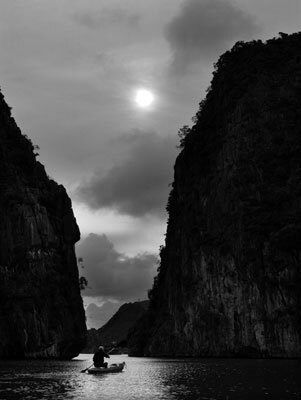 I said no more about Halong Bay, please just enjoy the pictures to feel what I felt. Fascinating!